Law Enforcement Grade Voice Activated And Automatic Telephone Tape Recorders! 15 And 32 Hours Of recording Time With Automatic Telephone Recording, Cell Phone Recording And A while Lot More. Only 3 1/4th inch By 1 1/8th inch By 1/2 Inch! "The Choice Of The Professional! " 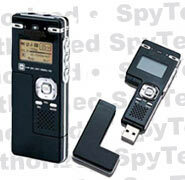 In 36, 70 And 140 Hour Models • Tiny Nano Sized Digital Recorder • Slim, Tiny And Black! • Automatic Telephone Recording Ability! • Super Sensitive Amplified Mic! • Sharp, Crystal-Clear Recording Every Time • Microphone Sensitivity Adjustable (18 levels). • Time And Date Stamping! 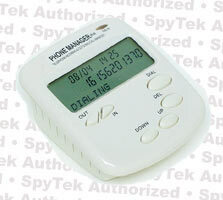 • Programmable Time And Date Recording! • Super High Quality Recording Results Every Time! Time And Date Stamping And Programmable Timed Recordings! Law Enforcement Grade! World's Smallest AudioRecorder! 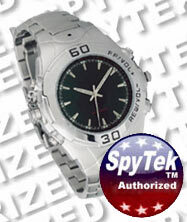 You'll fall in love with this nine hour covert watch audio recorder! Investigative evidence recorder you wear! 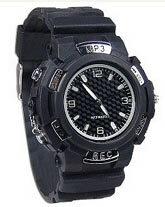 This is a very high quality fully functional watch with built-in digital recorder/player. This cool watch tracks the time and also stores up to 512 megabytes of your favorite music! This analog wristwatch combines an MP3 player and a voice recorder into one remarkable device! It features a USB 2.0 interface for fast and quick connection to your computer and provides over 9 hours continuous playback. A perfect complement for your active lifestyle! 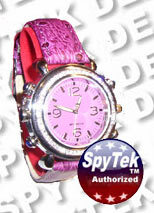 Covert Watch Recorder And MP3 Player! The new generation black pen recorders offers you the highest quality yet in a working pen digital recorder! 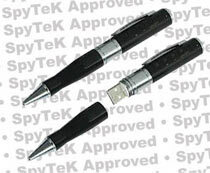 The sharp-looking black executive pen also functions as an extremely high high quality digital audio recorder in either 8 or 60 hour models with a super sensitive amplified mic. 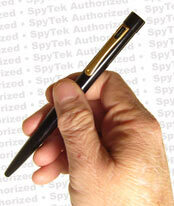 Executive writing Pen with your choice of 9, 20 or 60 hour digital audio recorder built in. Logs Caller ID Incoming Information And Outgoing Dailed Numbers With Time And Date Stamping. Can work in conjuniction with any recorder.